Budget Barbie: Redecorate? Or Repurpose? As many of my readers know, I'm in the middle of a very busy, crazy relocation across the country. We are in the middle of selling the house right now. While I was looking online for ideas of how to 'stage' our home by looking at model homes, homes on the market, decorating ideas and more, I came across some interesting 'before' and 'after' photos. I saved a few of them to my computer to look at later and this was one of them. Granted, the source tried to make it look worse by making the before 'dark and dreary' with a black and white photo but in general you get the idea. What I came away with was that I liked both ideas. The first photo would be keeping the room as it was; a formal dining room. However, not too many people these days use a formal dining room except maybe twice a year for a holiday dinner! So, if preparing to redecorate a rarely used room, another option would be to 'repurpose' it. In other words, redecorate to make it into a room that could be used year round. One thing I found interesting is that the designer who redid this room chose to put a 'too formal' chandelier in, in place of one I think worked much better in the 'before' photo with the new room. Other than the lighting I feel is wrong for the new re-purposed room, I can see where they were going with it and it's really a budget friendly way to add another 'usable' room to your home. 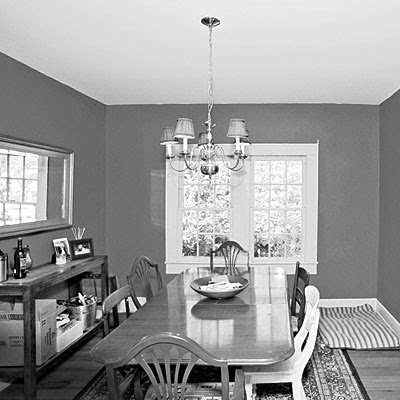 Gone is the fussy formal dining room that no one used. In it's place is a round table to be more family friendly and encourage active conversation. Adding an every day rug and comfy chairs invites kids to do their homework or a place for you to work on your laptop. Dinner around this table every night is a possibility while the hutch in the background provides a place to keep your 'good' dishes to bring out and use for those holiday meals. Personally I like the first photo as well. I can see with the laid back 'country' theme a happy dinner time could be had. Adding a valance , a different rug that fits the table and room better and cleaning out the buffet to be less cluttered, I love this room and think it had potential to stay 'country' and not be fussed up. I can totally picture a couple children comfortably doing their homework on the long table with the family dog laying at their feet. I do believe the room has to fit the personality of the family living in the space. In this case I'm seeing a lot of 'gray' area - it's not a black and white makeover.